If you love the tastes of Northern Indian food, you will love this easy recipe! It's hearty, healthy, and kid-friendly. You can leave it in a crockpot and eat it when you're ready. This dish is similar to a Mexican chili, but with Indian flavors and spices. Optionally, serve with a dollop of sour cream and a squeeze of lemon or lime juice. If you don't want this recipe to be spicy hot, simply leave out the cayenne powder. You will still have a very tasty meal that everyone can enjoy. To make this recipe extremely spicy, add more cayenne or other chiles—fresh or dried. We also like to serve Dallay Khorsani Pickles on the side. 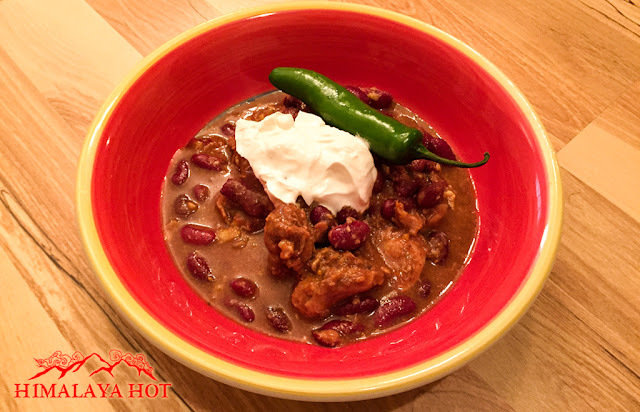 If you enjoy this Rajma recipe, be sure to check out all of our other spicy Himalayan recipes here.